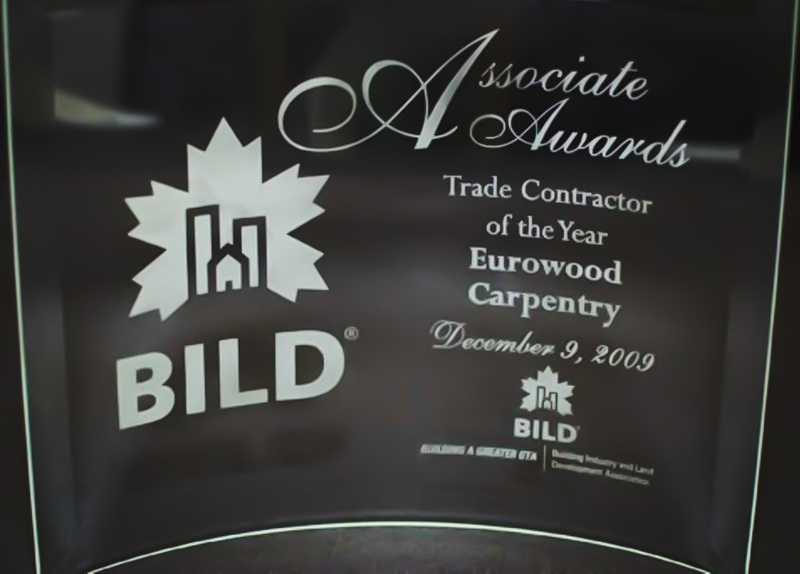 We are delighted to inform all our clients, that Eurowood Carpentry 2000 Inc. was awarded with the 2009 Trade Contractor of the year. This prize was handed out by BILD in order to recognize companies who are Highly rated by their homebuilder clients for professionalism, quality and service, as partners in the building process. Eurowood Carpentry, is highly experienced in professional framing of any project and offers many services including exceptional structural integrity and design fulfilling above industry standard quality. Our company was established in 1987. We are now one of the largest independent framing contractors servicing residential builders and commercial clients in the greater Toronto and surrounding area. Proud to be chosen to build the most exquisite and large homes in the GTA. With over 20 year�s experience, Eurowood Carpentry has earned a reputation for providing our customers with the highest quality and workmanship. We offer exceptional customer service, dependability, along with the highest standard in project safety. Our experienced framing carpenters use state of the art laser equipment while exercising all safety procedures. We also have certified forklift and crane operators to manage our zoom-boom and crane equipment. As experienced business leaders we have managed countless construction projects and we would like to extend our service and provide you with your carpentry. We would be pleased to prepare a competitive quote for any future projects and we will provide all necessary arrangements to pick up and drop off the drawings. For your convenience, we are also prepared to print all drawings sent by PDF files.